TAMPA, Fla. — Three speakers presented vastly different Tech Talks to a happy-hour crowd in the Composites Pavilion Tuesday evening. 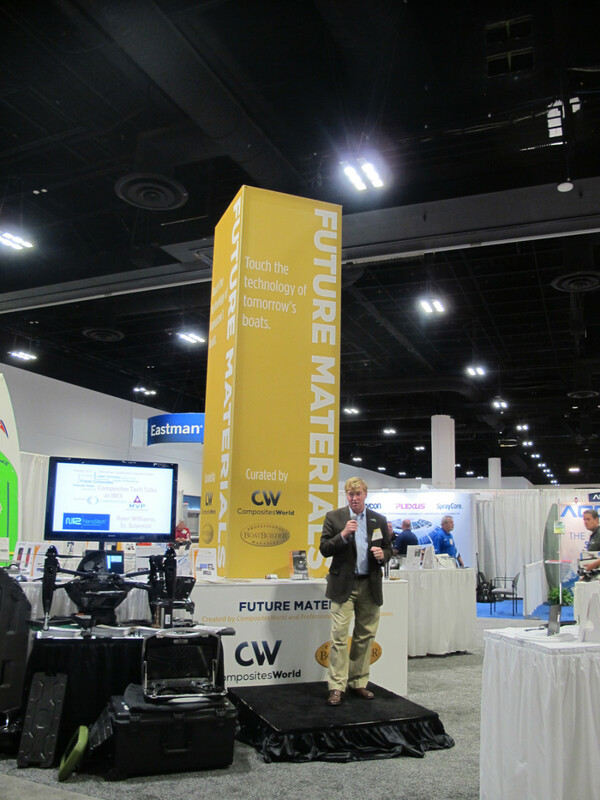 Ryan Williams, a senior scientist at N12 Technologies, speaks Tuesday evening during a Tech Talk in the Future Materials area of the Composites Pavilion at IBEX. TAMPA, Fla. — Three speakers presented vastly different Tech Talks to a happy-hour crowd in the Composites Pavilion Tuesday evening at the International BoatBuilders&apos; Exhibition & Conference. The complexity of the cutting-edge materials and the speed of the new processes now available was impressive. Despite the differences in their ages, products and presentations, each of the three speakers drove home the idea that technology is rapidly and continuously changing the look and feel of the marine industry. Ryan Williams, a graduate of the Massachusetts Institute of Technology and senior scientist at N12 Technologies, spoke about the way nanotechnology is achieving real benefits in composites through easy-to-use, drop-in products. Williams broke down complex processes and developments into user-friendly segments and demonstrated how composites can be made lighter and thinner. 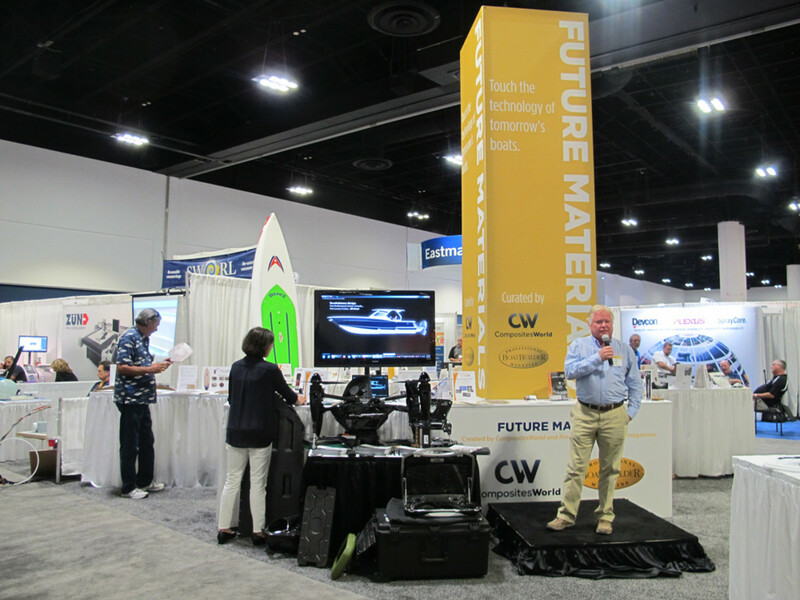 Scout Boats owner Steve Potts speaks during his Tech Talk in the Future Materials area of the Composites Pavilion. Steve Potts, owner of Scout Boats, spoke about the recent switch to resin infusion and epoxy for Scout’s largest production model, the 420 LXF. He spoke about the challenges of taking production boats to the next level through the use of technology and the vision for future composite development at Scout. 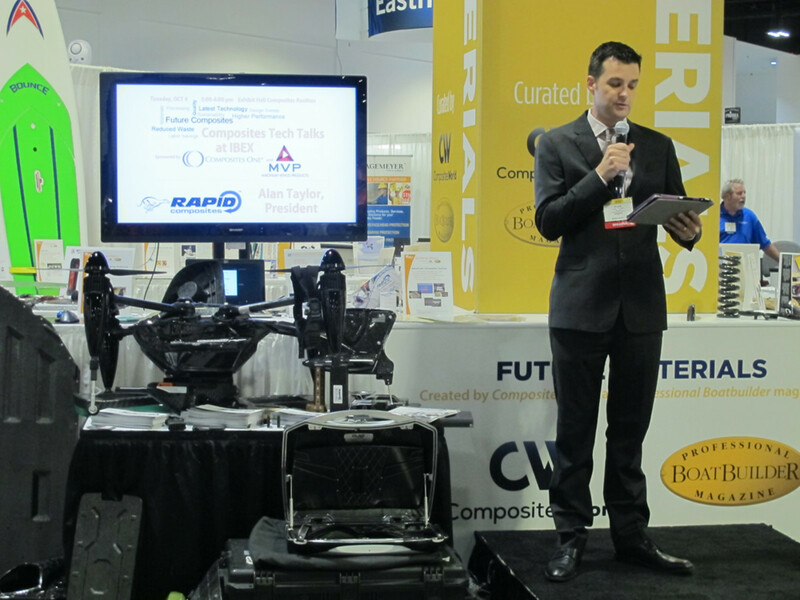 Rapid Composites president Alan Taylor speaks during his Tech Talk in the Future Materials area of the Composites Pavilion. Alan Taylor, president of Rapid Composites, spoke about what he sees as a potential revolution in composites with processing methods that eliminate 90 percent of energy use while delivering production cycle times as low as 45 seconds. Taylor outlined processes, speeds and expenses to show how small companies with limits on cash flow and space can achieve challenging requirements within tight budgets and timelines. He also brought a very high-tech-looking Rapid Composites drone to the show. The talks — a new feature at IBEX this year — were sponsored by Composites One and Magnum Venus Products and were part of IBEX’s set of Composite Tech Talks — informal, free forums where game-changing developments in composites are presented in a concise and dynamic TED talk format. The talks take place in the Future Materials area in the center of the Composites Pavilion and are organized by editors from Professional BoatBuilder and CompositesWorld magazines. “The goal for the Future Materials exhibit is to present a mix of innovative near-term practical applications for boatbuilders, as well as ideas to inspire novel solutions to present and future challenges in composites design, fabrication, end-use marketing, recycling and repair,” Aaron Porter, editor of Professional BoatBuilder magazine, said in a statement. "One of CompositesWorld&apos;s main goals this year is to show IBEX attendees materials and process technologies in several key areas, including nanotechnology, recycling and sustainability, and improved form and function, which could range from visually stunning fibers and laminates to added functionality like electrical conductivity,” said Ginger Gardiner, senior editor of CompositesWorld magazine. "At last year&apos;s Future Materials exhibit we saw hundreds of really curious people — chiefly boatbuilders, designers and technicians — who were fascinated by the potentials offered by the emerging composites technologies,” Porter said. “They got to know those materials and processes firsthand in a casual environment where they could hold new unprocessed laminates, touch and visually inspect samples of finished composites and experience live demonstrations of more subtle qualities, such as vibration dampening. We’re offering a completely new selection of promising, inspiring and sometimes baffling composites products as practical solutions and brain candy for the boat designers and builders at IBEX 2016." More than 75 companies make up the pavilion and offer the newest in composite industry technology and innovation in more than 12,600 square feet of exhibit space. Steve Callahan, vice president of materials at Chris Craft Corp., said IBEX offers the opportunity to interact with all of the marine suppliers in one venue with many potential sourcing ideas.